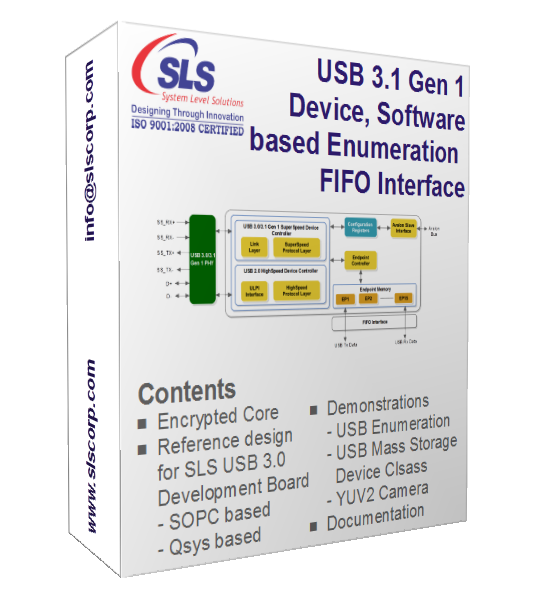 The SLS USB 3.0/3.1 Gen 1 IP Core is the SuperSpeed core that supports connectivity between TI USB 3.0/3.1 Gen 1 PHY (TUSB1310 ) and Altera® FPGA. The IP Core is wrapped around with software drivers and examples for its ease of use and quick integration. The ready to use USB 3.0 development board availability makes the integration faster. The IP Core package also contains the reference design that can be used directly for starting a custom application development. The IP Core has been optimized for Altera® FPGAs and its functionality has been verified on the hardware with Altera® Quartus II software. The package includes ModelSim precompiled library for IP Core simulation and verification. Although the SLS USB 3.0/3.1 Gen 1 IP Core is designed and proven working at maximum throughput in a point to point environment, in reality the overall systsem determines the real speed implementation would experience. Notice: All Host Controllers are not cerated equally!!! USB 3.0/3.1 Gen 1 IP core's functionality is verified in ModelSim simulation software using test bench written in Verilog HDL.